It’s officially 2018. With the new year, spring semester, and thoughts about what the future may hold, it’s not uncommon for uncertainty to chip away at the excitement. Oftentimes life can be uncomfortable, but that’s not necessarily a bad place to be. It’s all about perspective. Step 1. Remember that situations are temporary, so keep a positive attitude. Don’t get caught up in the worst-case scenario. The key to great leadership is being able to rise above the situation and be positive. What are my expectations? Are they realistic? Many stress related problems occur because of unrealistic expectations. Be honest with yourself and realize that sometimes being a perfectionist can be a recipe for disaster. What are the lessons? There are typically a few good lessons in every challenge faced. Take a step back and look at what those lessons are and make note of them for the future. What’s the bigger picture? How important is this difficulty in the overall scheme of things? What will this matter five years from now, even one year from now? Don’t devote precious energy to circumstances which do not carry life or death consequences. Widening your perspective and stepping back will enable you to improve your attitude and mindset, reduce tension and stress, and develop deeper self-awareness. I wish you all positive thoughts as you launch into the new year and semester. Continue reading below in the Monthly Motivation section for Mental Calibration: 5 Steps to Focus Better and Maintain Perspective. 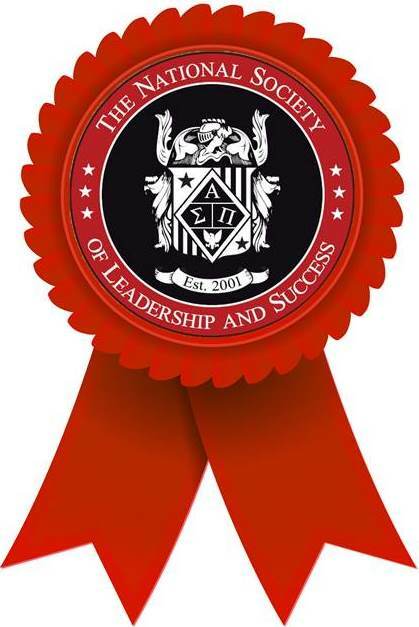 The Society Essentials are a collection of items sure to show off your Society pride as you embark on your journey towards success! Lanyard: The perfect item to keep track of your keys or ID card. Easy to find, easy to grab, complete with a metal clip for a super secure hold. Pennant: Classic plush felt hanging pennant with Society inspired graphics. Perfect to hang in a dorm, bedroom or living space. Society Drawstring Bag: Lightweight, versatile backpack features zip pockets and an earbud port to help organize and carry your gear. Water Bottle: This stainless steel bottle holds up to 17 oz. of liquid and features double wall vacuum insulation and a screw‐on cap. 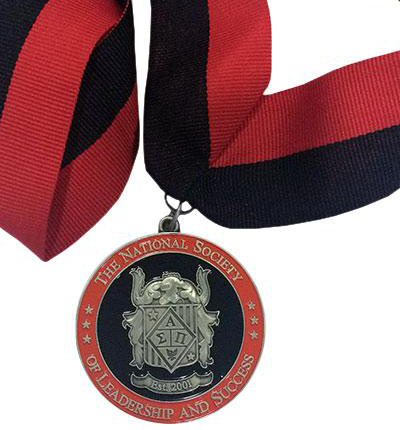 The handsome Graduation Medallion features the Society Crest on metal with an antique silver finish hung from a red and black ribbon. Requirements to order this item: You must be fully inducted to order graduation items. Be sure to check your campus policies on honor distinctions at graduation prior to ordering. 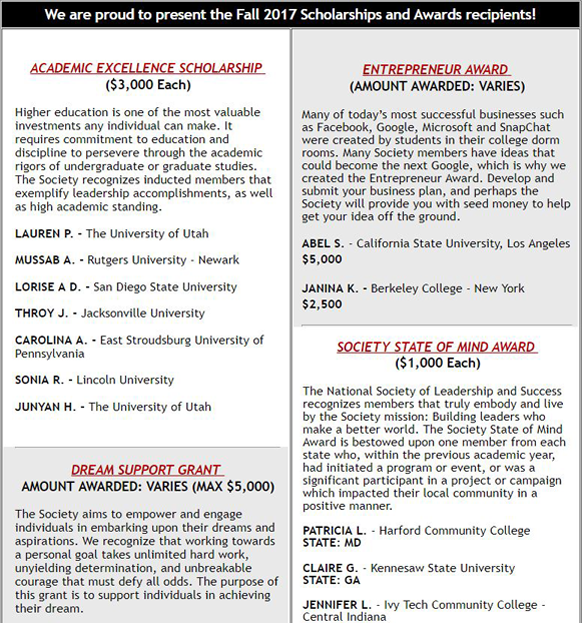 Fall 2017 Scholarship and Awards Recipients Announced! 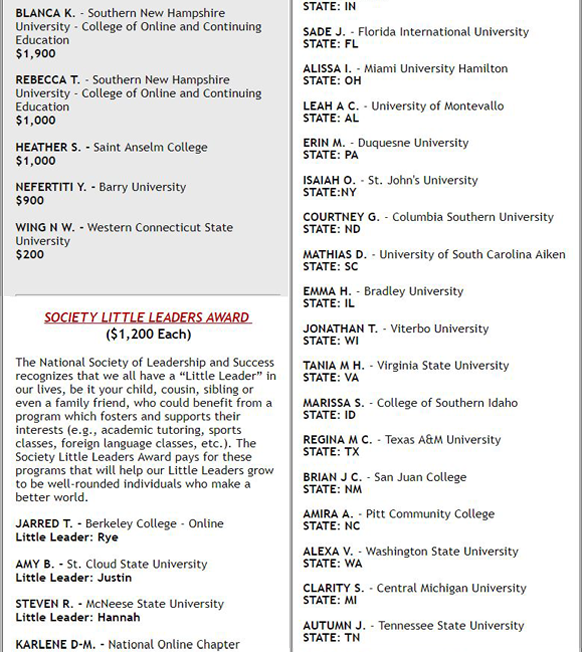 The National Society of Leadership and Success partners with specially selected organizations who offer Society members tools to help them on their path to success. Partners offer significant discounts only available to Society members as well as connections and resources to help members in their future careers including access to internships and job opportunities. 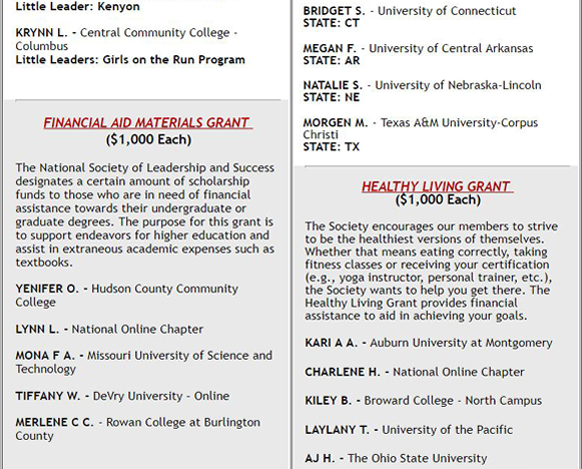 In addition, some of these partners provide financial support to the Society each time Society members take advantage of these discounted offers. 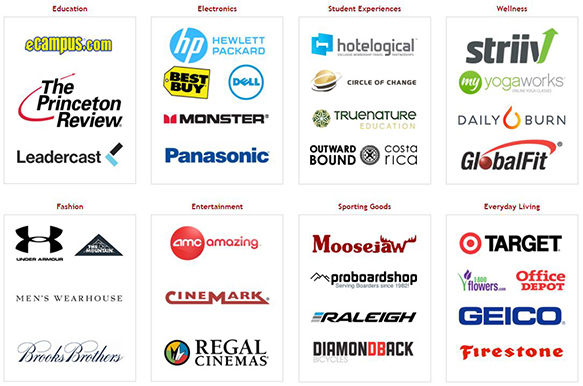 For the full list of partner discounts you receive as a Society member, please log into the Members Area by clicking here. 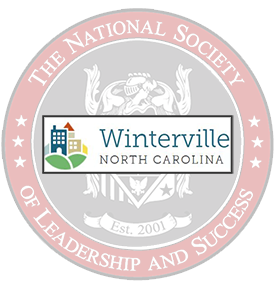 Five years after moving from the nation’s capital to Greenville, Amira Ali has been selected as North Carolina’s recipient of The National Society of Leadership and Success’s (NSLS) Society State of Mind Award. A native Egyptian, Ali earned a bachelor’s degree in Arabic & Islamic Studies in her home country before coming to the United States 15 years ago. She moved to Greenville from Washington, D.C., in 2012 and has become an active member of the community. On Saturday, December 9th, the Casper College chapter of The National Society of Leadership and Success held its Fall 2017 Induction Ceremony on campus in Casper, WY. The chapter honored 39 new inductees and two award recipients,“Excellence in Teaching” winner Dr. Evin Rodkey (pictured far left) and “Excellence in Service to Students” winner Danielle Gallegos (pictured far right). 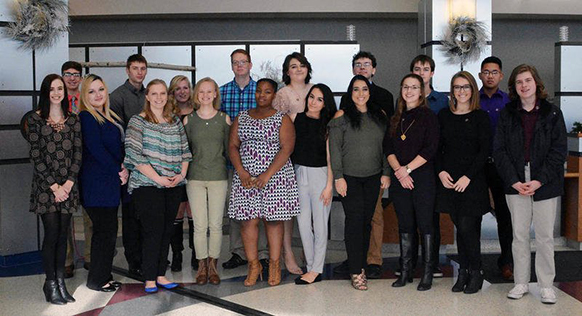 The Kishwaukee College chapter of The National Society of Leadership and Success held an Induction Ceremony December 1st, on campus honoring 28 new members. The chapter also recognized faculty and staff members at Kishwaukee College for their support of the student experience on campus. 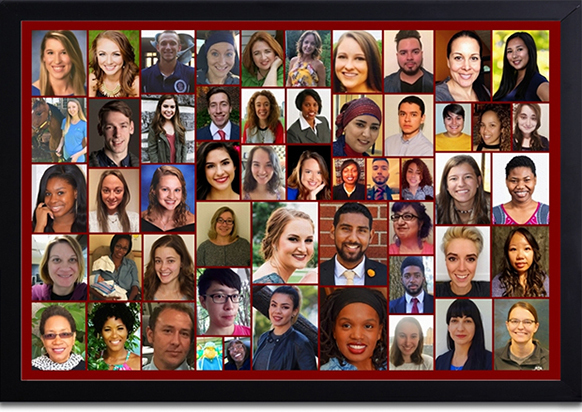 Receiving a Plaque of Recognition were "Excellence in Teaching" – Todd West, assistant professor of English; "Excellence in Service to Students" – Scott Kawall, director of Student Involvement; and Pernevlon Ellis, assistant professor of sociology. Life is frantic. It’s easy to get caught up in a flurry of email, errands, hobbies and arguments… so much so that you collapse into an exhausted heap on your bed at the end of the day. Wrung out, worn out, you stare toward the ceiling as your thoughts spiral in guilty cycles. There’s so much you didn’t get done.